I was born in Harlingen, the Netherlands, in 1970. 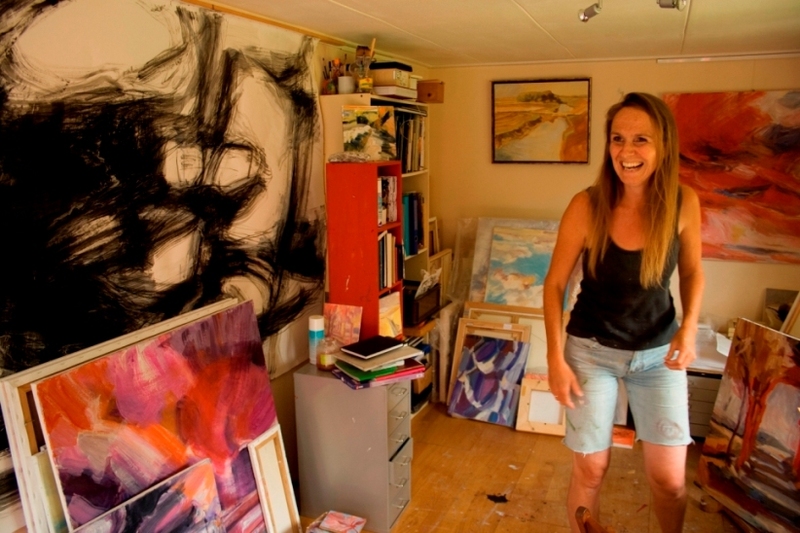 When I was 19 I moved to Groningen to study at the art academy, at first graphic design, but after a short while I changed to drawing and painting. Illustration was my minor. During my studies I received a scholarship to study William Turner’s work in London. I am married and we have three children. After graduating I continued to develop my painting. On a regular basis I exhibit my work and participate in art routes. I have also worked for an advertising agency as a freelance designer and illustrator for a while. Besides I have taught and once in a while I give workshops. At the moment I am training as a creative therapist. 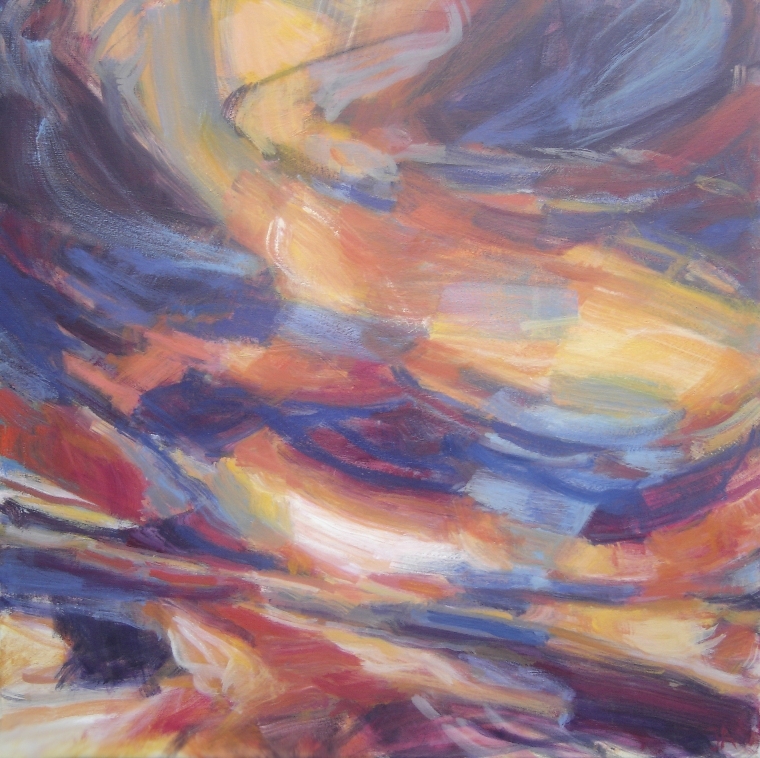 My work finds its origin in high skies, clouds and wind, sun and shadow, land and water. Dramatic skies and continuously changing light find their expression in subtlety of colour and a dynamic handwriting. 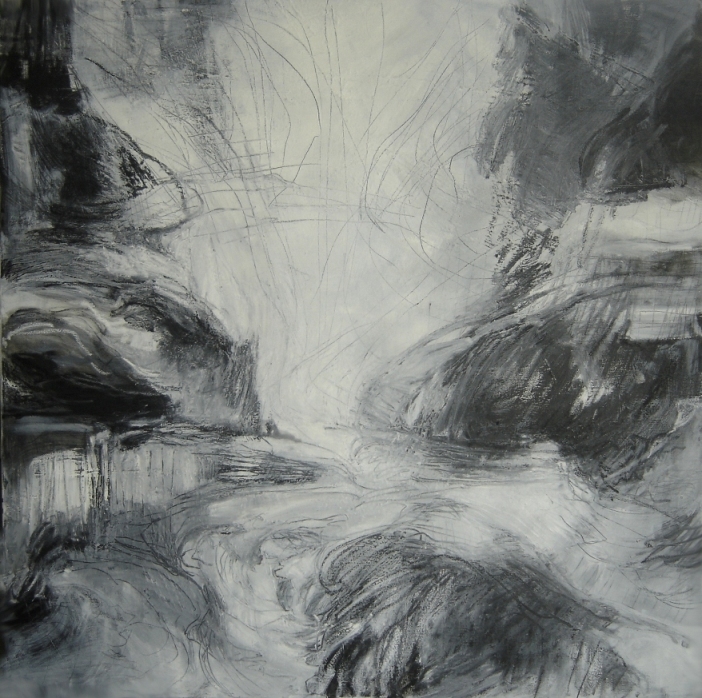 I set up a painting spontaneously, sometimes outside, sometimes triggered by a sketch, a photo or a movement. Drawing is very important for me as well: a personal hand, working very directly. More and more I try to combine painting and drawing in my work. On the basis of the first intuitive outline I continue to work. Unexpected effects occur that evoke new forms and colours. A painting is a playground to me, a place of colour and surprises and at the same time an arena in which a fight takes place between balance and movement. A space results that is abstract yet inspired by the landscape. The landscape is a motif that will always remain, while providing space and freedom it also functions as a mirror of the soul: atmospheres, storms, light and dark. People live in a landscape. Something is happening or has happened there, there is meaning. That story is told through the act of painting or drawing. The handwriting is the voice, loud or soft, quick or slow, with emphasis or casually, a lot or a little. It is a tale in line and colour: everything that finds and has found its way into the painting remains visible, not successively but in layers that pile on top of each other into one image. I find my inspiration in the countryside. I try to follow the movement of the light and the clouds in my work. On everything falls a supernatural light: that’s how it is in my life, that’s how I see the world. I want to show all that is there and give it meaning in a blending of poetry and emotion, difficult to capture in words, expressed more intuitively. My examples are primarily expressionists like Emil Nolde, Armando, Antonio Tapies and Per Kirkeby. But also the work of Rembrandt and William Turner is a source of inspiration because of its drama of movement and light. 1. Flood, 100 x 100 cm, mixed technique (acrylics, crayon, oil bar [oil paint in the form of crayon]) on canvas. This work was made shortly after the tsunami in Japan. I was busy with a new technique to apply all kinds of black and white materials in layers on top of each other, a combination of drawing and painting. The drama of the black and white corresponded to the dramatic images of the tsunami. I had images of the disaster with me while working, not to paint them but to see what a landscape looks like which has been totally turned upside down but is still inhabited. This led to a series of black and white works, dramatic landscapes like those by Turner, full of dynamics and big movement. 2. Swing Down Chariot, 90 x 90 cm, oil paint on canvas. The title of this work is derived from a vision of Ezekiel: the chariot riding through the heavens, with fire and might, with the Lord on it. I see the clouds and the sky as subjects that show something of the grandeur of God. The space, the light and freedom are overwhelming. 3. 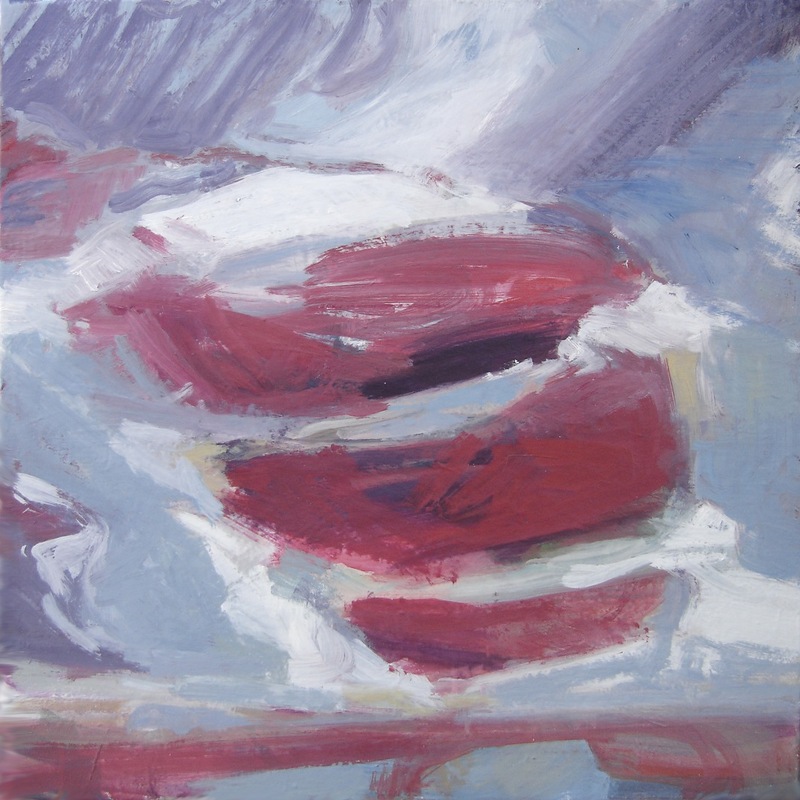 Three red clouds, 50 x50 cm, oil paint on canvas. 4. In the forest, 40 x 30 cm, oil paint on canvas. 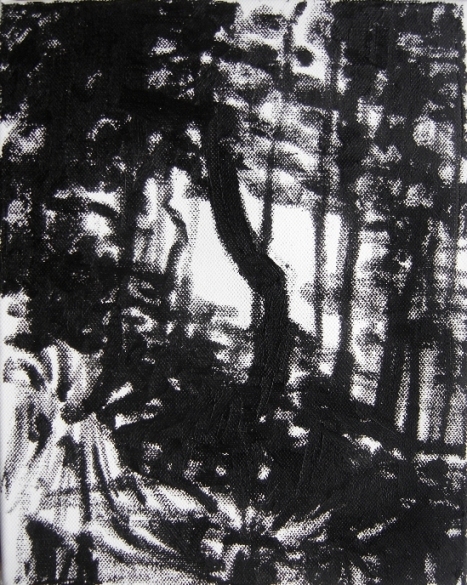 A painting drawn outside with oil bar (oil paint in the form of crayon), part of my efforts to integrate drawing and painting. 5. Summer, 20 x 50 cm, oil paint on canvas. Also landscapes continue to be part of my work. They form a source of inspiration for more abstract works.